The Northeastern Pennsylvania Philharmonic has been a beacon of culture and arts education since 1970. This regional orchestra produces outstanding, high-quality shows. Patrons love both its artistry and its commitment to the community. It features something for everyone, presenting concerts with a range of musical styles. Their productions are a true artistic treat. If you have an opportunity to see them, don’t miss it! 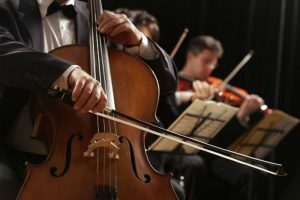 Seeing the Northeastern Pennsylvania Philharmonic is a great way to infuse some culture into your vacation. As you look for more incredible activities to add to your itinerary, make sure to download our Complimentary Vacation Guide. It’s an amazing resource! The guide brings together the area’s best arts venues, restaurants, and events into one convenient document. It takes the stress out of vacation planning. When you have it, everything you need is right at your fingertips! The Northeastern Pennsylvania Philharmonic is in Scranton, Pennsylvania. It produces live orchestral music that soothes the soul and invigorates the senses. The musicians are masters of their craft and prove their skills via concerts held throughout the year. The Masterworks Series is the keystone of their programming. It focuses on the classics, performed in grand style. The Northeastern Pennsylvania Philharmonic enriches its community in many ways. Aside from creating beautiful orchestral performances, it also provides music education to children. The group introduces young people to new music and culture. They produce family programs, age-appropriate shows, and experiential learning opportunities. The musicians cultivate a sense of value for the arts by creating engaging learning opportunities. The Music Mentoring Program, Young People’s Concert, Music in Our Schools Program, and bi-annual Piano Competition are examples of their efforts. The Northeastern Pennsylvania Philharmonic ensures that youth develop a passion for the arts. If you have a love of music, but don’t have the time for a trip to Scranton, you can still enjoy the orchestra’s work. The Northeastern Pennsylvania Philharmonic hosts an annual concert in the Poconos. It is our honor to host it right here at Ledges Hotel. Listen to a beautiful performance in our exquisite setting and avoid the long drive. This year’s Philharmonic concert will take place on September 24, 2017. It’s just in time to enjoy the beginnings of our beautiful autumn. Join us on our Serenity Deck for an amazing concert that will infuse your life with a harmonic blend of culture, nature, and music. Follow us on Facebook for announcements regarding ticket sales leading up to the event. After an evening of music and culture with the Northeastern Pennsylvania Philharmonic, come inside and relax. Getaway for the night in a room at the gorgeous Ledges Hotel. Our beautiful accommodations and top-tier amenities are the perfect way to experience a little luxury in the Poconos. We pride ourselves on our customer service and look forward to helping you have a fantastic vacation. Contact us soon! We look forward to helping you plan your next incredible getaway!